We just finished watching the movie Monumental on a preview screening night and really enjoyed it. Kirk Cameron did a superb job of walking us through an engaging history lesson of the Pilgrims rise, persecution, and departure from England in 1600s. He traces the journey from their secret meeting places, to the prisons where King James held them after their first escape attempt, to their haven in Holland. He follows their path finally on to the American continent. 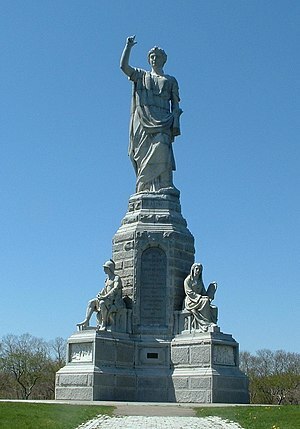 In Plymouth, Massachusetts, Cameron and his guide explain the rich symbolism set in granite in the National Monument to the Forefathers (pictured) that was erected in 1889 honoring the Pilgrims. Their winning strategy for building a society revolves around starting with faith, then morality, law, education, and finally liberty. We enjoyed the movie and recommend seeing it. This movie will be received differently by different audiences depending on where they stand on the continuum of liberal to conservative. For instance, if they are pretty aware of the evidence for the religious background of the pilgrims and their foundation in biblical principles and agree with those principles they will probably be encouraged and enjoy this movie. If they have those same leanings of principle but were unaware of the evidence and history surrounding the Pilgrims coming to America, they will probably feel encouraged and somewhat incredulous. They may need to find some more answers to these questions. I recommend the book Original Intent for people in this category. If they find themselves more in agreement with the revisionist misinformation of the last 100+ years they will probably feel either uncomfortable or downright angry about the information portrayed in this movie. Monumental attempts to circumvent a lot of the liberal misinformation that has been brought forth in the last 50 – 100 years in America. WallBuilders Live! aired a three part recording of Tim Barton this week speaking to Patriot Academy on American Exceptionalism. What makes America great… or rather, what made America great? “If we forget what we’ve done, we won’t know who we are.” – Ronald Reagan. Tim makes the point that this war was not just fought because of taxation without representation. That is a modern deconstructivist, revisionist fallacy. The Founders had deep convictions about their splitting from England. If you look at the Declaration of Independence (Click here), of the 27 abuses listed as reasons to assert our independence from England, 8 were judicial abuses, 8 were legislative abuses, 9 were military abuses, and only 2 were economic abuses. However, if you ask anyone why we had the revolution, most people know the answer to be taxation without representation. We have forgotten where we came from. Tim colorfully weaves stories throughout his explanation of what made America great. He tells several stories of American heroes from the Revolution that we never hear nowadays. For example, Elizabeth Lewis, wife of Francis Lewis, signer of the Declaration, stood at the door of her home while being fired on by cannon. She was thrown into a British POW camp, and fed bread and water once a day, became malnourished, and died shortly after her release. Do you suppose she stood up before cannon fire because her family was being taxed without representation? No. There was a deeper conviction than this. If we actually read the Declaration,we understand better. Mr. Barton related stories like Naphtali Daggett, pastor and pro tempore president of Yale, who went out to meet the British with 100 other men to hold them off and give the towns people a chance to evacuate New Haven, CT. The 100 man set up along a hillside to hold back the British, but Naphtali Daggett climbed a hill way ahead of them and began sniping the British troops. The 100 men were driven back and the British advanced. Daggett was left alone in his position. 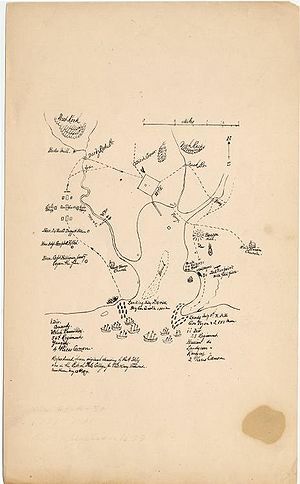 The British commanding officer journaled that he had heard shots ring out every few minutes, and he was going to ignore them, except that one of his men was getting taken out with each shot. They went back and found this old man shooting at them. They captured Daggett but when the commanding officer saw that it was just a one old man by himself he offered to let them go free if he would promise not to shoot at them anymore. Naphtali Daggett said there was nothing more likely than that he would keep on shooting the soldiers. That answer cost him his life. This is just one example of a story of sacrifice and courage from our War for Independence. If you would like to hear more of these stories and a more complete explanation of American exceptionalism, please listen to Tim Barton’s presentation on WallBuilders Live!